1. This crawler bulldozer is equipped with WD10G178E25 supercharged diesel engine with optimum power reservation coefficient. 2. The hydraulic torque converter and gear box with hydraulic power shift are adopted in the hydraulic system to meet different work conditions. 3. Humanized operation layout is applied for crawler bulldozer cab, which features high efficient and comfortable. 4. The steering system and braking system are controlled by hydraulic power. The shovel blade and scarifier controlled by joystick, flexible, safe and reliable. 5. 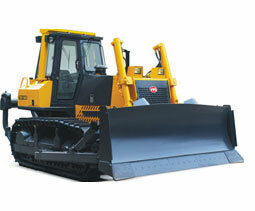 The crawler bulldozer has advanced structure and beautiful appearance.